NDC's moisture analyzers for marshmallows production | Quality2Process B.V.
Marshmallow Santas are a traditional Swedish Christmas sweet and are produced in their millions each year at the Cloetta factory near Linköping, Sweden, where NDC moisture measurements help Cloetta produce perfect Santas, through control of the moisture in the molding starch. The Swedish name for these marshmallow Santas is Juleskum (literally: Christmas foam). Every Santa is expected to be perfect in terms of taste, fluffiness and appearance. 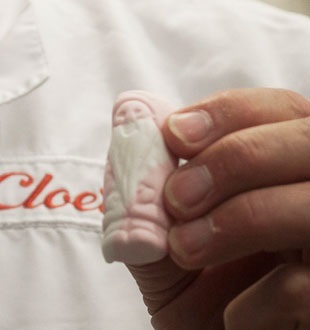 The Santas are created using a process resembling casting metal in sand moulds but instead of containing sand, the moulding trays contain corn starch. The process involves adding white marshmallow for the beard, then red marshmallow, and finally the Santas are dried. The moisture content of the cornflour is crucial to the end result. Otherwise the moulds can deform or cornflour residue can remain on the Santas. hough the procedure in the lab is automated nowadays, it still takes ten to fifteen minutes to produce a measurement. for a specific product,” Kjell says. Cloetta has recently installed another production line for marshmallow products. Because the lines are some distance apart, the company has purchased another NDC measurement device, an InfraLab Food Analyzer. The new analyzer has an integrated measurement head and resembles a coffee making machine. 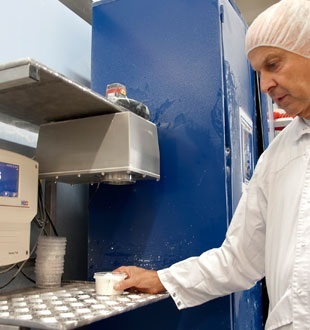 It has laboratory-standard performance and is calibrated to measure the moisture content of cornflour in particular. 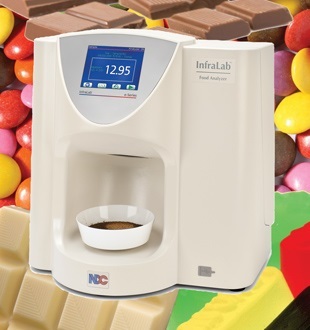 The InfraLab analyzer meets strict hygiene standards and is quick and easy to use. Just collect a sample and put it on the machine’s turntable. After five seconds the reading is stable. All measurement results are stored. Cloetta's Juleskum Santas are sold from October onwards and this year they also come in a golden brown shade with a toffee flavour.